Poster designed by Tom Cober for the "Say We Are Here" exhibit. 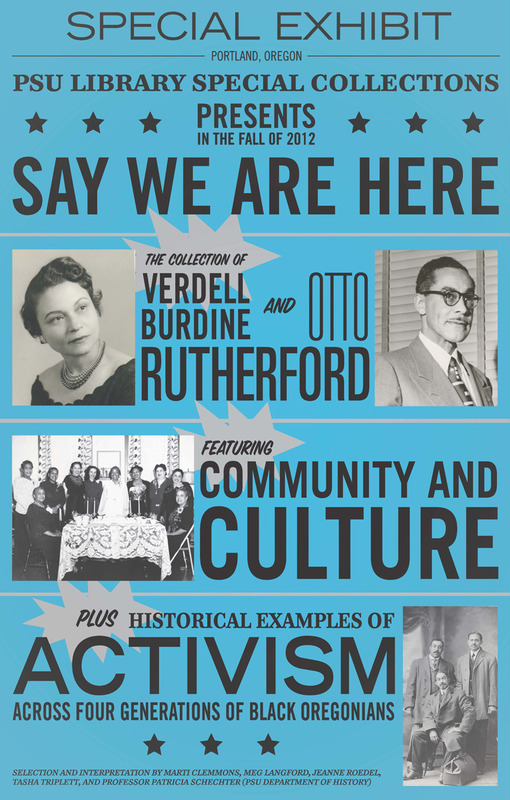 Verdell A. Burdine Rutherford (1913-2001) and Otto G. Rutherford (1911-2000) were leading members of the African American community in Portland for much of the twentieth century. The photographs, documents, publications and ephemera in this exhibit represent the depth and breadth of the Rutherford family's community service while also providing a rich overview of the institutions and events central to Black Oregonians over the past one hundred years. The materials shown in this digital exhibit were presented in a physical exhibit from September 2012 to January 2013 in the Portland State University Library. Please visit Say We Are Here on PDXScholar for more information, including the full catalog and video of the opening speakers. More digitized resources from the Rutherford Collection are also available in PDXScholar.